In an earlier post I briefly discussed the scale of the challenge. In this one I discuss briefly how the report discusses ethical issues surrounding responsibilities towards future generations, with a special focus on discounting and how it relates to cost estimates of various energy options. “The use of a temporal discount rate has a crucial impact on the evaluation of mitigation policies and measures. The social discount rate is the minimum rate of expected social return that compensates for the increased intergenerational inequalities and the potential increased collective risk that an action generates. Even with disagreement on the level of the discount rate, a consensus favours using declining risk‐free discount rates over longer time horizons (high confidence). “A simple arbitrage argument favours using the interest rate as the discount rate for climate policy decisions: if one reallocates capital from a safe but marginal project (whose return must be equal to the interest rate) to a safe project with the same maturity whose return is smaller than the interest rate, the net impact is null for the current generation, and is negative for future generations. Thus, when projects are financed by a reallocation of capital rather than an increase in aggregate saving (reducing consumption), the discount rate should be equal to the shadow cost of capital. This discussion on discount rates is in my opinion very important since discount rates capture lots of the ethical underpinnings of our responsibilities to future generations. Discount rates tell about our time horizons and about how patient we are in waiting for gains. If you are offered money right now and twice as much at a later date, how long are you willing to wait? If the discount rate is 10%, you might be ready to wait for about 7 years and if it is 5% you wait for 14 years. Stern review used a rate of 1.4% for climate change damages in which case you are ready to wait for 50 years. In this case the time horizon is truly inter-generational. As explained by the WGIII, how to discount is in the end of the day a normative choice. 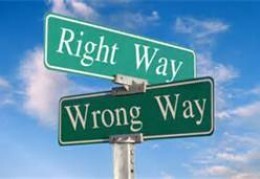 However, it is a choice whose impact should be openly discussed and a choice that should be reasonably defended. In general I found the Chapter 3 “Social, Economic and Ethical Concepts and Methods” interesting and I have to read it more carefully later. I recommend that authors of WGIII Chapter 7 “Energy Systems” also read it. WGIII gives the levelized cost of energy for different energy sources in Figure 7.7 of Chapter 7. If you look at figure 7.7 (below) carefully you will perhaps notice something funny. In the 4th assessment report at 2007 the costs were given as shown in Figure 4.27 (see copy here). It is not the most beautiful of figures, but clear enough. It shows the results at two different discount rates with coal, gas, and nuclear as the lowest cost options. Somebody was clearly not happy with this and wanted to change the figure into Fig. 7.7 of the new report. As I glanced at the figure first I naturally choose to compare “red” bars with red bars and blue ones with blue. After all we shouldn’t compare apples and oranges. Maybe you did the same? However, I then noticed that red color assumed “high full load hours”. What does that actually mean? In order to figure out, one has to read the annex III for detailed assumptions (how many are going to do that?). 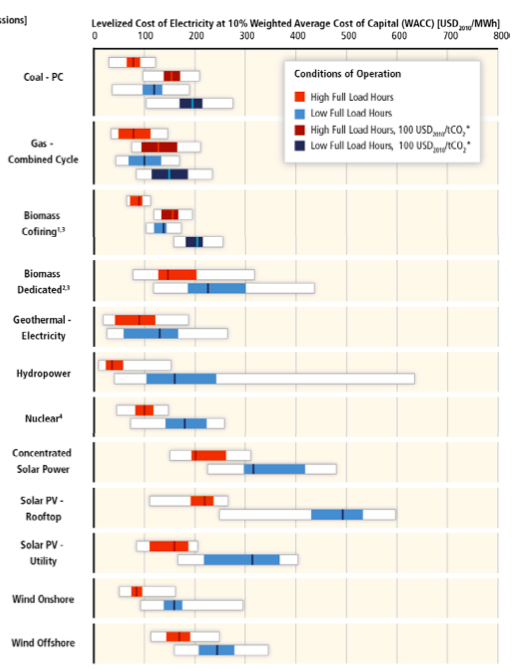 For nuclear power “high full load hours” meant a capacity factor of 84 %, for onshore wind 40%, and 27% for solar PV. For nuclear power this a typical capacity factor (although many reactors do better), but for wind and solar power those capacity factors are very atypical. So the figure is constructed in such away that uninformed reader is likely to make incorrect comparisons. In fact, WGIII concludes the caption of Fig. 7.7 (its on the next page and likely to be missed) by saying “Note: The inter-comparability of LCOE is limited. For details on general methodological issues and interpretation see Annexes as mentioned above. ” Indeed. Given that comparisons cannot really be made, why was this approach chosen in the first place? If you can come up with a charitable explanation I am all ears, but to me this seems like authors of Chapter 7 were actively working to make comparisons hard. How did the authors of Chapter 7 approach the discounting? Let us guess that economic growth in the future is around 2%. In this case the Ramsey rule mentioned by the IPCC in Chapter 3 suggests a discount rate in the range of 2-6%. What discount rate is used in chapter 7 to compare levelized cost of energy (LCOE) for different energy sources? That would be 10%! Authors of WGIII decided not only to use very high discount rate, but also not to give their results at different discount rates so that the effects of this assumption could be observed. Considering that authors of Chapter 3 specifically emphasized how crucial this issue is in evaluating mitigation policies, the approach in Chapter 7 seems indefensible. At minimum one would expect them to show results over broad range of discount rates, but this they decided not to do. Since they refused to do it, I will quickly do it here and see what difference it makes. (Note that some results with 5% discount rate are hidden in annex III, but these are only for the high FLH case so no honest comparison is possible.) In order to make sure that I know what I am doing I try to reproduce typical LCOE figures for WGIII high FLH case. I copy typical numbers from the annex III and this is what I get. OK, the numbers are not exactly the same, but close enough for me. I am not sure how WGIII defined the median here. Also, maybe there is some index inconsistency somewhere in the summations…who knows. Basic point is that I can reproduce the WGIII values reasonably well and I am on the same map as WGIII. We are ready to go! So let me then look at the things WGIII decided not to show. I will now compute typical LCOE for few technologies at 10%, 5% and 1.4% discount rates. It turns out that as discount rate is lowered the LCOE for nuclear power drops from 97$/MWh to 62$/MWh, and finally to 42$/MWh. I will summarize the rest of the results by giving the costs relative to nuclear power. The values colored green are higher than the LCOE of nuclear while red is lower. As you can see green dominates and with the possible exception of hydro power in good locations, nuclear power is the lowest cost zero carbon source of electricity no matter what discount rate was used. At 10% discount rate it has difficulty at competing with coal, but at 5% it becomes cheaper than coal. As discount rate is lowered the cost advantage of nuclear relative to other low carbon energy sources is rapidly increased. With 1.4% discount rate and a time horizon extending across generations nuclear power is cheaper than other options by a very large margin. These results are based on the WGIII numbers and the only changes are those listed above to mainly account for differences in capacity factors. We could make the above table all green by adding a carbon price of only around 20 $/tCO2. Maybe this discussion on the role of discount rates is simply too radical and WGIII is just following conventions? Well, not really. It is certainly not too radical for WGIII since in its 2011 SSREN report focusing on renewables WGIII gave precisely this type of comparison with 10%, 7%, and 3% discount rates (Fig 10.29 p. 844 in Chapter 10). Some of its authors were even authors of this report. Of course from SSREN report nuclear power was purged at the outset and results which might give readers funny ideas did not have to be shown. Absurdly the discussion on discount rates in this context is far more extensive in SSREN while in this report it has been brushed aside contrary to the emphasis by the authors of Chapter 3 of WGIII. We can only speculate as to why. To me it seems that on this issue the authors of Chapter 7 were working hard to make sure that uninformed would remain uninformed while giving a chance to say to informed ones: “We are not lying! We are open about the methodology…see annex III etc. Yeah, maybe figure 7.7 is not as clear as it could be. Thanks for the tip! Clear communication is super important and we will keep it in mind for the next assessment report! Blaah blaah blaah…” IPCC should be an expert body giving accurate evidence based material for policy discussions. Sadly in this case WGIII decided not to give this material and compromised its supposed “policy-neutrality”. In plain english, authors of Chapter 7 decided not to do their jobs since doing it would have provided facts suggesting that some mitigation policies are likely to be more effective than others. But this is what they should do! If people decide to brush the cost differences aside, that is their choice, but it is not the role of an expert to fudge figures in such a way that implications of different policy choices are hidden. Authors of Chapter 7 did what? “The IPCC still thinks it might be possible to hit the emissions target by tripling, to 80%, the share of low-carbon energy sources, such as solar, wind and nuclear power, used in electricity generation. It reckons this would require investment in such energy to go up by $147 billion a year until 2030 (and for investment in conventional carbon-producing power generation to be cut by $30 billion a year). In total, the panel says, the world could keep carbon concentrations to the requisite level by actions that would reduce annual economic growth by a mere 0.06 percentage points in 2100. These numbers look preposterous. Germany and Spain have gone further than most in using public subsidies to boost the share of renewable energy (though to nothing like 80%) and their bills have been enormous: 0.6% of GDP a year in Germany and 0.8% in Spain. The costs of emission-reduction measures have routinely proved much higher than expected. Moreover, the assumptions used to calculate long-term costs in the models are, as Robert Pindyck of the National Bureau of Economic Research, in Cambridge, Massachusetts, put it, “completely made up”. In such circumstances, estimates of the costs and benefits of climate change in 2100 are next to useless. Of the IPCC’s three recent reports, the first two (on the natural science and on adapting to global warming) were valuable. This one isn’t.” The Economist. While I think the report has some interesting things as well, when it comes to cost estimates I tend to agree with The Economists. Finally, in my opinion the fact that companies use the short time horizons implied by 10% (or higher) discount rates is a clear indication of a market failure. Climate change requires longer term decisions and if such decisions cannot be delivered by current markets, those markets need to change. Either the state with a longer time horizon must become more active or appropriate sticks and carrots should be developed to discourage short term profit taking and promote longer term visions.